I have a split leaf philodendron (Monstera deliciosa) that came from my mother’s plant, which was a cutting off of the philodendron that my grandmother got in the 1950’s. The plant in my mother’s apartment is much fuller, and clearly happier, than mine, but I keep this Monstera prettypathetica nevertheless. Given my attachment to this plant, I understand why I get so many calls on GardenLine, asking about preserving plants that came from family members. “I have a peony that belonged to my grandmother,” or “My ivy plant that was started from the ivy in my daughter’s wedding bouquet,” are typical calls. Plants not only tie us to family members, but to people in history as well. 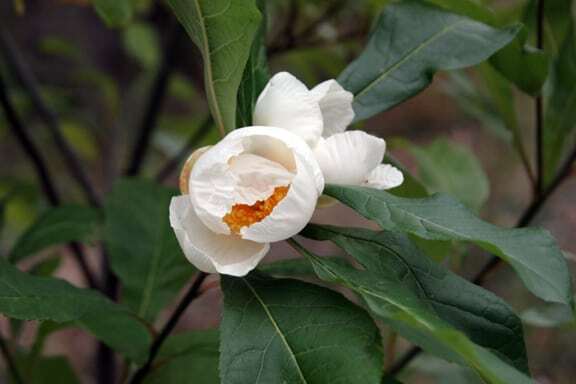 Many of us grow a Franklinia alatamaha not just because it’s a lovely, late blooming tree, but because every Franklinia is a direct descendent of those seen by John Bartram in 1765. John’s son William collected seeds from this plant during this same period, and the small tree was never seen in the wild again. Every time I see my young Franklinia in bloom I think of John Bartram, coming on this plant and writing in his journal about seeing “severall very curious shrubs”. I love the fact that William named the plant after his father’s friend, Benjamin Franklin. It’s almost like having an ancestor of these great Americans in my own yard. It is, of course, our connection to people that’s important, not the specific plants themselves. But if those plants in our homes or gardens serve as touchstones that keep us connected to family, friends, and others throughout history, then we are blessed to have and grow them. In September and October my Franklinia is filled with these crisp, white flowers. Thanks, John and William!